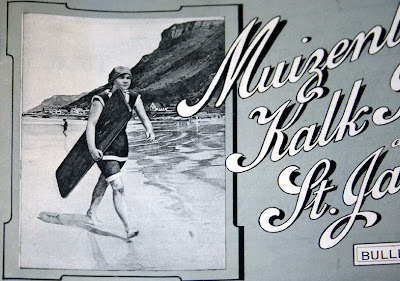 This is from a publication from 1923 for Muizenberg, Kalk Bay, and St. James, South Africa, with a surfer on the cover, as well as within, that talks about the region and describes both prone and early stand up surfing. This came to us via Wingnut from an acquaintance of his. We're hoping there will be more to follow. Muizenberg, South Africa, was quite the hotbed of surfing and bellyboard/paipo board surfing in the early 20th century. The UK was quite effective in spreading the sport (bellyboarding) throughout the "empire." Is there a complete title and publisher of this book available? The closest item that I can find is the item below but note that the date is 1913. Could not find a 1920s edition, but these tourist brochures were often reprinted over a considerable period. 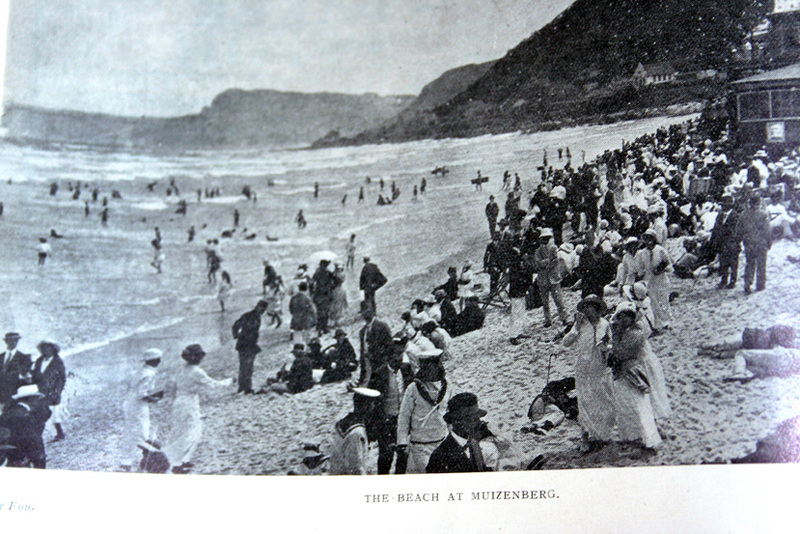 Cape Peninsula Publicity Association: Muizenberg, Kalk Bay and St. James : an ideal all the year holiday resort. 40 p. : ill. ; 21 cm. The earliest known stand-up surfing in South Africa was at Muizenberg Corner, in 1917. There are photographs of Heather Price, a friend's great aunt, being taught to surf by some U.S. servicemen. The Corner is still by far the most popular learn-to-surf break in Cape Town, as well as being much favoured by longboarders. It's the most forgiving of the local waves, the water is generally warmer than the Atlantic seaboard and the town itself is both surf-orientated and a bit Bohemian. Great family vibe on the weekends.